POST a QUESTION or READ FAQs about installing a hard-start capacitor to get an air conditioner motor, fan motor, or other electric motor running. This article explains how to choose & buy an electric motor start capacitor, hard start capacitor, or run capacitor that is properly rated for and matches the requirements of the electric motor such as an AC compressor motor or fan motor where the capacitor is to be installed. These electric motors use a capacitor to start and run the motor efficiently. We explain the choice & wiring procedures for a hard start capacitor designed to get a hard-starting air conditioner compressor motor, fan motor, refrigerator, or freezer compressor or other electric motor (such as a well pump) going. Green links show where you are. © Copyright 2017 InspectApedia.com, All Rights Reserved. Watch out: do not attempt electrical repairs if you are not trained and equipped to do so. Making a mistake can cause a fire or serious injury or death. Capacitance is the ability of a device to store an electrical charge. 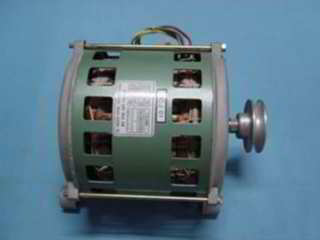 An electric motor capacitor is a device that first stores, then releases an electrical charge to help start an electrical motor (starting capacitor) or to keep it spinning (run capacitor) - the electrical charge or potential energy stored in the capacitor is used to give a power boost to the motor to help it overcome inertia - to start rotating. How do you know that an electric motor needs a replacement starting capacitor? If the electric motor hums without starting or has trouble starting, but will run if given a push (e.g. a spin of a fan blade - watch out for chopped-off fingers) the start cap is probably bad. If the starting capacitor is bulged, burned, has a hole in it, or has leaked oil, it is shot and needs replacement. If the electric motor draws high current when running or hums and won't start the run cap is probably bad. If the motor hums but the thermal overload protection switch has not tripped, the start cap is probably bad. If the run capacitor is bulged, burned, has a hole in it, or has leaked oil, it is shot and needs replacement. A dual capacitor - combines two capacitors in a single physical device, one to run a higher-amperage motor such as the compressor in an air conditioner compressor/condenser unit, and a second smaller capacitor to run a smaller motor such as the cooling fan motor in the compresor/condenser unit. Watch out: not all electric motors, such as pool pumps, use starting or run capacitors. 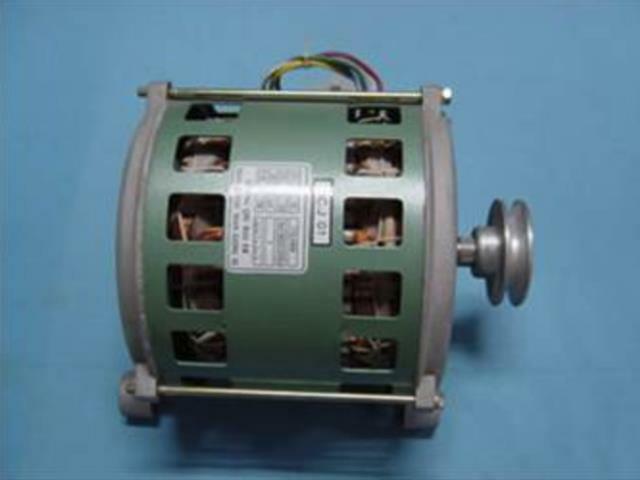 For example a split-phase motor, often used in spas and hot tubs and at many above-ground swimming pools, uses a start switch and start winding but does not use a starting nor a run capacitor. A "permanent split capacitor" motor uses a run capacitor but not a starting capacitor. Motors of this design, often found in in-ground swimming pool pumps, have a low starting torque and need only a run cap. The best option if you are replacing a starting capacitor or a start/run capacitor is to match the existing device on your system. That means noting the data printed on the existing capacitor - if it's legible and matching that. Our capacitor tables given at the start of this article also provide general advice on matching a motor capacitor to the motor voltage and size ratings in Volts and kW or kilowatts. Our photo illustrates a Mars-brand starting capacitor rated at 25uF and 370VAC - this cap is used ion AO Smith motors and is identified as 25MFD 370V - 628318-307. Since there are just two terminals we know this isn't a start+run capacitor. Examine the original capacitor and match its ratings in Voltage and and capacitance, uF or micro farads. Look for and record all of the markings on the capacitor. Typically you'll see a rating in microfarads like the 25uF in our capacitor photo above, and you'll also see a voltage rante rating such as the 370VAC (maximum voltage) rating also in the red circle of our photo above. If the capacitor markings are legible, they'll be able to match it. If the capacitor markings are not legible the electrical supplier or motor rebuilder will recommend a start, run, or combination capacticator based on the motor data tag information. What if the Capacitor is Lost or Has No Legible Markings? 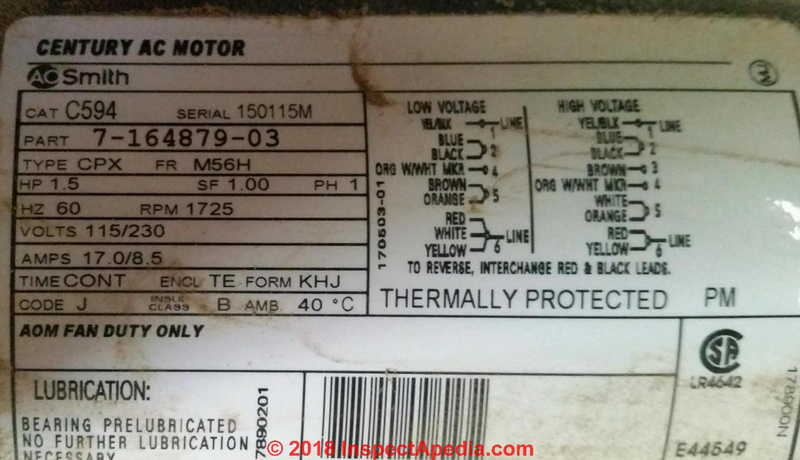 With the motor brand and model (and hopefully serial number in hand) you can also get the exact OEM part number - contact the motor manufacturer they can give you the exact OEM capacitor replacement part number or specifications. Check the motor type & motor part number and data tag specifications and use a motor part substitution or OEM part catalog. For readers whose capacitor has no markings whatsoever, your electrical supplier will want to know the technical details about the capacitor's intended use. Those can be found on the motor data tags for the motor served by the cap. Typical pool/spa motor capacitors: some pool pumps use a motor that gets a start-up boost from a starting capacitor. For example a typical aboveground pool, hot tub or spa motor will use a starting capacitor rated around 50-400 MFD and 125 or 250 VAC. And for the same motor, the run capacitor will be rated around 15-50 MFD and 370 VAC. The voltage rating of a capacitor indicates the highest nominal voltage at which it is designed to operate. Use of a capacitor at voltages below its rating will do no harm. Run capacitors must not be subject to voltages exceeding 10 percent of the nominal rating, and start capacitors must not be subjected to voltages exceeding 30 percent of the nominal rating. If you cannot find any data giving the motor's brand, model, specifications, and you have no markings nor even the actual old start/run capacitor from an electcric motor, you might get into the right ballpark by choosing a capacitor based on the motor's horsepower and voltage and application. If you don't even have that data, we're stuck. Take the motor to an electrical motor repair expert who might find markings you missed. If the motor has no legible markings nor data tag, first check again. Some electric motors such as oil burner motors have data stamped right into the metal casing of the motor itself. The data may be there but only visible under good lighting. Watch out: as a general rule of thumb, electric motor start capacitors can be replaced with a micro-farad or µF or mfd rating equal to or up to 20% higher µF than the original capacitor serving the motor. 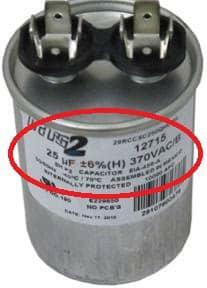 On the replacement capacitor the voltage rating must be equal to or greater than the original. Watch out: do not touch an electric motor capacitor nor any other electrial components before you have removed electrical power and SAFELY discharged the capacitor or you can get a serious shock or injury. 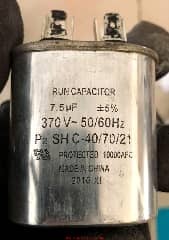 Replacement capacitor for-sale listings may be described leaving you to interpret the numbers, such as this example: 35+5 uF +5%, 370VAC, 50/60Hz - this is a 35µF Start + 5µF Run capacitor, capable of handling voltage up to 370 volts alternating current (so you're ok with 120 volts or 240 volts). 1. Watch out: these are only "ballpark guesstimates" - check with the manufacturer of your specific motor and application. For example among the motor type "pool pump" horsepower range may mean different capacitor values. If your capacitors burn out quickly there are several common reasons: wrong capacitor size (too small), motor is damaged, or mis-wiring. 3. 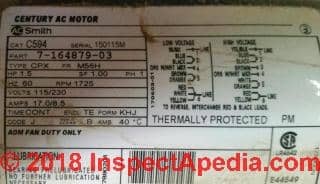 Typical replacement sold for a Goodman brand air conditioner at online parts suppliers - Ed. Watch out: Wallmart capacitor prices on 20187/06/30 were observed to be up to ten times or more higher than other vendors of the same or equivalent parts. Check also with your local electrical supplier. 5. Watch out also: not all motors use start, run, or combination capacitors, and some motors such as those sporting a switchless motor or "PSC" (Permanent Split-Capacitor) motor requires a run capacitor that improves motor efficiency and stays in-circuit when the motor is starting or running. Capacitor energy ratings are expressed in farads - the amount of electrical power stored in the capacitor, where µF or µF = microfarad (10-6 farads) and is the same as mfd (microfarads) written in other references. Rated capacitance for a capacitor is the capacitance value (electrical energy storage value) for which the capacitor is designed. The rated capacitance has to be sufficient to give the energy boost or kick to the electric motor to start it spinning (a start capacitor) or to help keep it spinning (run capacitor). Capacitors are also rated for the voltage range in which the capacitor can safely operate, such as 220V or 440V. 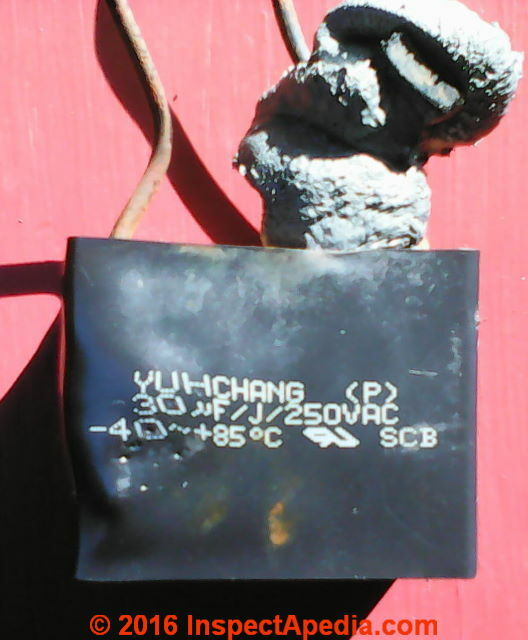 The starting capacitor photo shown here, provided 2018-07-10 by reader Robert, is marked as rated 35 +5 uF 440V 60HZ. That's 35 microfarads +5% and is the capacitor rating, along with voltage, that the reader will need to specify when buying a replacement. 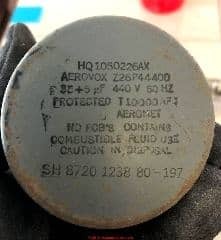 We also see a specific part number: SH 8720 1238 80-197, but I in replacing this capacitor you'd attend first the rated capacitance and voltage. Rated voltage for a capacitor is defined as the highest continuous voltage that can be applied to the capacitor at its rated temperature without damage. Depending on the application, the micro-farad range of starting capacitors varies according to the motor size. The voltage range for a start-up capacitor typically ranges from 250VAC to 450VAC. Watch out: When you are replacing an electric motor capacitor, never put in a lower rated capacitor. If you cannot get an exact size match to the original motor capacitor, it is acceptable to use a capacitor rated one step higher in µF. The substitute capacitor must be able to handle the voltage. Run capacitors typically range in micro-farads from 1.5 to 50µF. or 50 microfarads or MFDs. For example you can't sub a 110V-rated capacitor into a 220V system. Robert's run capacitor shown here is rated at 7.5 µF +/- 5%, 370 Volts, and 50/60~ or cycles. The cap also sports it's part number. You can also check a capacitor to compare its performance with its microfarad rating by using an ohmmeter. In a working capacitor ohms will build-up and then fall off (when the capacitor discharges). HVAC suppliers sell general-use starting capacitors that are intended for use across a range of electrical motors and motor sizes. But at least some industry sources (the Sealed Unit Parts Company or Supco) make a more careful argument explaining that it's best not to install a significantly oversized starting capacitor on an electric motor. If the start capacitor is too large for the application, the capacitor can actually mask the developed voltage in the start windings and keep the start capacitor in the circuit continuously. .... The ... run-start voltage is suppressed below the trigger voltage of the start device. As a result, the start capacitor remains in the circuit as the motor runs. A secondary, fail-safe method is necessary to ensure that the start device is ultimately removed from the circuit. ... A start device that fails to remove the start capacitor from the circuit has the potential to cause premature failure of the start windings in the compressor. ... If the capacitor is never removed from the start windings, premature winding failure could occur. As such, care should be taken when selecting capacitor sizes for an application. Care should also be taken regarding products that tout a "bigger capacitor is better" approach to compressor starting. SUPCO E-Class devices provide a secondary timing safety device to ensure that the start capacitor is dropped from the circuit in a fail-safe mode. [Italics are ours-Ed.]. Capacitors are also rated in working classes which describe the expected service life of the capacitor in hours, assuming the cap has been properly selected. 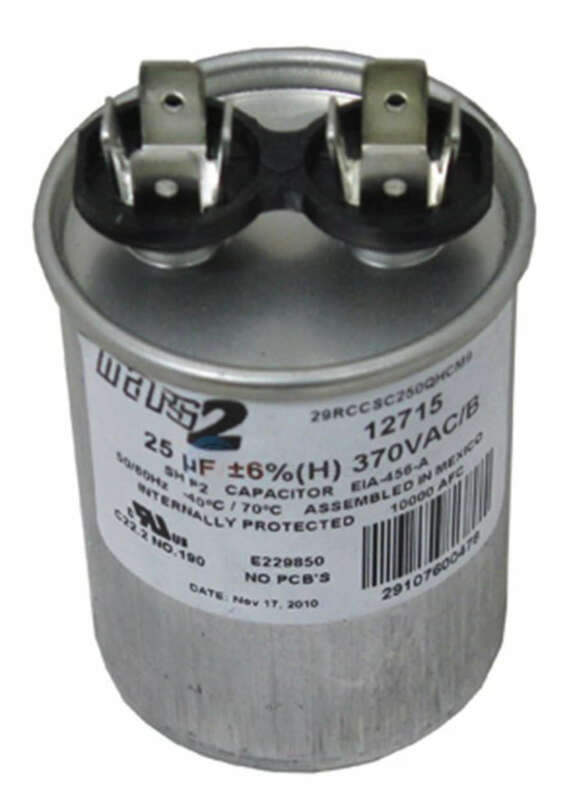 Copeland Industrial Capacitors such as the Copeland Stoelting 231047 run capacitor shown here for use in a Copeland brand HVACR compressor motor system. The SUPCO SPP6 Super Boost hard start capacitor increases starting torque up to 500%. Features: Installs in seconds across run capacitor terminals Contains specially designed relay and large start capacitor for severe hard start problems. Applications: Room A/C units, Residential and commercial PSC A/C units and heat pumps, For all PSC A/C units from 4,000 thru 120,000 BTU's (1/2 thru 10 H.P.) Can be used on 120 thru 288 VAC units, For severe low voltage and hard starting compressors. AO Smith ELECTRIC MOTORS for the FARM [PDF] Op. Cit. Essex, Brown: "Motor Repair Supplies" (Catalog), Essex Group, Inc., 1601 Wall St., Fort Wayne, Indiana 46801, Tel: 219-461-4633, Website: www.superioressex.com, retrieved 6/20/14, original source: http://www.essexbrownell.com/uploadedFiles/Content/Products/MR%20Supplies%20Catalog-s.pdf - see pp. 86-89. MOTOR START and RUN CAPACITORS [PDF] AFCAP (African Capacitors Limited), Metallized polypropylene film capacitors for motor running applications web search 08/05/2011, original source: http: //www.afcap.co.za /manual/Part2.pdf; 2018/07/11 update: the original source link is no longer valid - Ed. Sealed Unit Parts Co., Inc., PO Box 21, 2230 Landmark Place, Allenwood NJ 08720, USA, Tel: 732-223-6644, Website: www.supco.com, Email: info@supco.com, Website: http://www.supco.com/ , Supco Catalog, retrieved 6/20/14, original source: http://www.economicelectricmotors.com/cdrom/catalogs/Supco_catalog.pdf - see pp. 2-6. 1. Voltage sensing technology that monitors for motor start (current sensing devices require internal fuse protection). The use of compressor start devices results from a need to ensure that a compressor (usually air conditioning) will start under voltage conditions that are less than ideal. As discussed, several options exist in the market to address compressor start concerns. Start devices exist in many forms for specific applications. SUPCO provides a full range of products in all relevant technologies to effectively match the proper start device to the application. Care should be taken to utilize a device that meets the requirements of the job. Extra caution should be observed when employing the "one-size-fits-all" and "a bigger capacitor is better" approach to applying a start device. Consult SUPCO, a manufacturer with a complete product range, to ensure the greatest success in the start device application. van Roon, Tony, "Capacitors", [online article], retrieved 6/20/14, original source: http://www.sentex.ca/~mec1995/gadgets/caps/caps.html, gives a very detailed history of the invention and history of electrical capacitors beginning with van Musschenbroek's Leyden jar in 1745. This article includes "Capacitor Nomenclature" by Dean Huster. This book provides practical guidance and application information when using capacitors in electronics and electrical circuit design. This easy-to-use book covers the following capacitor types: Ceramic, Plastic Film, Aluminum Electrolytic, Tantalum, Glass, Mica, and others. This book also has a very comprehensive Glossary and Index. The Selection Guidelines and the Symbols and Equations sections have the answers to all of your daily application questions. This book is one in a series of component handbooks. Where are the Motor Capacitors Found? Danno I think the scrambled order is not an issue as long as the key numbers on the capacitor match its application or match the old one AND as long as you connect the proper wires. The capacitor you are describing marked 35/5 440 is probably a dual run capacitor. 35/5 : The first two numbers are the capacitance 35 µF (for the compressor) and 5 µF (for the fan motor). A dual "run capacitor" supports two electric motors, such as in large air conditioner or heat pump units, with both a fan motor and a compressor motor. "HERM", which stand for the Common, Fan, and HERMetically sealed compressor. A 440 volt capacitor can be used in place of a 370 volt, but not a 370 in place of a 440 volt. The capacitance must stay the same within 5% of its original value. Round cylinder-shaped dual run capacitors are commonly used for air conditioning, to help in the starting of the compressor and the condenser fan motor. Watch out: Take a look at the wiring sheet that should be with your capacitor or wiring marked on the device itself to be sure that you are properly connecting the Start and Run wires and you'll be OK. I have a Wayne 1 HP motor used as a utility pump. The capacitor burnt out. It is a rectangle plastic capacitor with two wires coming off of it. I read you article on how to choose a capacitor still it’s all Greek to me. So what am I looking for? Anon: in response to your query I've re-written our capacitor selection explanation. Four ways to find a matching or replacement motor capacitor are given at CAPACITOR SELECTION TIPS in this article. Also if you can, send me some sharp photos of the cap and its markings and I may be able to comment further. Post a photo of your existing motor capacitor and its markings at the page bottom comments box, or use the page top or bottom CONTACT link. Hereps a photo of the capacitor I'm talking about. OK so we know this is probably just a single-purpose motor-start capacitor, since starting capacitors are most-oftem 125, 165, 250 and 330 volt devices while run capacitors are rated for higher levels like 370 and 440 volts. If it were a dual-purpose capacitor you'd see 3 rather than just 2 terminals. You'll have no trouble buying a replacement at your local electrical supplier or even from an online supplier. Prices for a motor capacitor start at under $10. U.S. Ask for a 30 microfarad 250VAC motor start capacitor. Take along the old sick one to show your supplier. At HOW TO WIRE up a START CAPACITOR we show how to hook up a typical capacitor. Watch out: Keep me posted on how you do, and work with POWER OFF so you live to tell me. Question: what is the right start capacitor for the motor shown in this photo? Could you please point me towards the correct capacitance for a start capacitor that can be connected to the engine presented in the attached picture? The label reads 16 µF 450V, that's the capacitor that Zhang Qiu Hai Er DianJi You Xian Gong Si the manufacturer specifies for this particular electric motor, apparently model QC.J 01. Correct, the labels reads 16µF 450V. Is this the capacitance/voltage that I should use for the start capacitor? The 16µF seemed too low compared to the tables you presented in your website. The final Authority on the correct start or run capacitor to use with any motor is of course always the motors manufacturer. The motor shown looks like a Haier double speed electric motor shown in the photo below, excerpted from haiermotor.en.ec21.com/ where no details nor specification sheets for the motor were found. Zhangqiu Haier Electromotor Co., Ltd. is a long-established producer of Haier electric motors located in Zhangqiu Economic Development Zone Jinan, Shandong, China and doing business since 1958. The company became a subsidiary of Haier Group in 1998. These motors are used in household appliances such as washing machines, with other motor models used in refrigerators, air conditioners and other equipment. Continue reading at HOW TO WIRE up a START CAPACITOR or select a topic from closely-related articles below, or see our complete INDEX to RELATED ARTICLES below. HOW to CHOOSE a START / RUN CAPACITOR at InspectApedia.com - online encyclopedia of building & environmental inspection, testing, diagnosis, repair, & problem prevention advice. The use of compressor start devices results from a need to ensure that a compressor (usually air conditioning) will start under voltage conditions that are less than ideal. As discussed, several options exist in the market to address compressor start concerns. Start devices exist in many forms for specific applications. SUPCO provides a full range of products in all relevant technologies to effectively match the proper start device to the application. Care should be taken to utilize a device that meets the requirements of the job. Extra caution should be observed when employing the "one-size-fits-all" and "a bigger capacitor is better" approach to applying a start device. Consult SUPCO, a manufacturer with a complete product range, to ensure the greatest success in the start device application. Tom Morris, Engineer, capacitor discussion and correction to the original data. Email to D Friedman 5/29/2006 - Thanks Tom for critical editing. The text above explaining about capacitors was suggested by Mr. Morris. The original text of the 1993 compressor diagnosis article had the resistance explanation backwards. 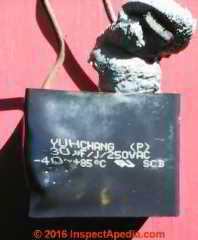 Thanks to reader James Oiler for reporting on the replacement of a heat pump starter capacitor, August 2010. Complete List of Air Conditioning & Heat Pump Design, Inspection, Repair Books at the InspectAPedia Bookstore.